This holiday provides a fine introduction to a comprehensive spread of Finnish activities. You will have an incredible time with the grand trio of snowmobiling, dogsledding, and cross-country skiing. There’s also a reindeer sleigh ride and Aurora snowshoeing for slower-paced outdoor entertainment. As for local delights, the Lampivaara Amethyst Mine is otherworldly and unforgettable. 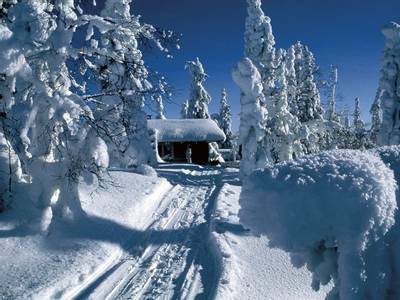 Sample a spread of unmissable Finnish activities in Luosto and return each day to the comfort of your homely log cabin. Over a week, you’ll experience Arctic favourites such as cross-country skiing, dog sledding and tracking the Northern Lights on snowshoes. There’s also a snowmobiling trip to the Lampivaara Amethyst Mine for a taste of local culture. Try out a complete collection of classic Finnish activities during our Taster Week in Luosto in Lapland. We waste no time in getting you immediately acquainted with Nordic favourites and local highlights. You will snowmobile through the snowy wilderness surrounding Luosto to its famous Lampivaara Amethyst Mine. Travelling all the way to this part of the world and not visiting this location would not be right. A fascinating presentation about the gems is followed by a visit to the surface mine. You will even be given the chance to dig for your very own piece of amethyst to take home with you – if it is small enough to enclose with your fingers! You will also enjoy the delights of cross-country skiing during a ski lesson before taking to the trails which surround Luosto. A highlight of this holiday has to be the husky safari, where bounding dogs carry you through the breathtaking surroundings. A further animal-related experience comes with a reindeer park visit, allowing you to enjoy a magical reindeer-pulled sleigh ride in the forest. As Luosto is well within the Aurora Zone, you will also have high chances of spotting the glimmering Northern Lights, and we will improve your chances with an Aurora snowshoe trek. Retreating each day to your own cosy winter cottage is a joy. 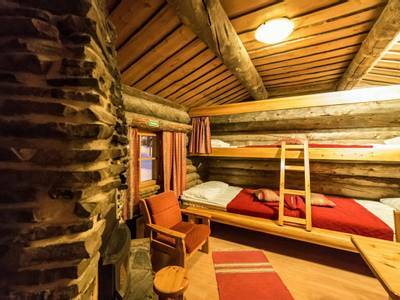 Each has a wood-burning stove and private sauna, making for a relaxing stay. You will also have access to the pool and well-being facilities at the nearby Tunturi Hotel, where your half board meals will be served. If you are travelling over the New Year then you will be joining in with the hotel’s wonderful celebrations. These will normally include a celebratory meal and live music on New Year’s Eve. Please ask our Travel Experts for further information. 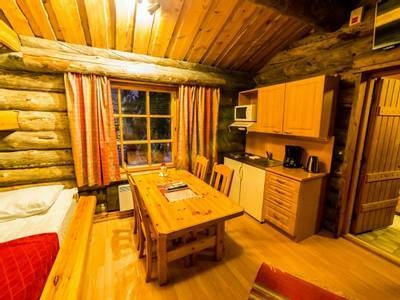 Upon arrival, you will be met by a driver and transferred to Luosto, where you can get settled into your cosy log cabin. Dinner will then be served in the hotel restaurant. Following breakfast this morning, you will be transferred to a local reindeer park to meet with some of the animals. You will learn a little about the traditions of reindeer herding, many of which still play a prominent role in the lives of herders. A reindeer-pulled sleigh ride ends this wonderful experience. Warm drinks and snacks will be provided around a campfire. Spend the afternoon relaxing in your cabin before dinner in the hotel restaurant. Finish breakfast and spend today as you wish in Luosto. You might like to try out some local activities or simply relax in your cabin. Dinner will be served in the hotel restaurant. This morning you will be introduced to the world of cross-country skiing. After breakfast, an instructor will show you the best techniques before you take to the local trails. This is one of the most popular activities in Lapland and it can be very addictive. After breakfast, you will drive snowmobiles to the Amethyst Mine. You will be given full instructions on how to operate the vehicles before following a guide on the marked snowy trails through forests and wild landscapes. You will travel two people per snowmobile and if you wish to drive you will need a full driving licence. If you do not wish to be on a snowmobile, you can sit in a sled pulled by the guide’s snowmobile. It is also possible to upgrade to riding one person per snowmobile. At the Lampivaara Fell, you will settle down in a warm kota and hear the story behind this fascinating destination. From there, you head to a covered section of this surface mine to hunt for your own gemstones. If you find one small enough to enclose in your hand, it’s yours to keep! You will then snowmobile back to Luosto. On this second free day, you can book more local activities. After the previous day’s skiing, you might like to book out cross-country skis to explore at your own pace. Dinner will be served in the hotel restaurant, leading into a Northern Lights search by snowshoe. You will be guided into the night-time countryside to search for the Aurora, stopping along the way for hot drinks. Once you’ve had breakfast, there will be time to visit the hotel pool or take to the snowy trails outside. The afternoon brings what is often seen as a highlight of a holiday in Lapland: the thrilling husky safari. You will be taken by car to a husky ranch, where you can get to know the dogs and learn how to harness them to a sled. You will then enjoy a stunning ten-kilometre ride through the great outdoors. 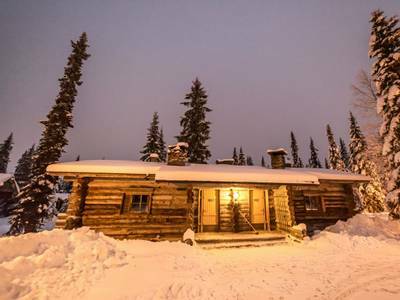 Returning to the ranch, you can relish a hot drink by a fire while talking to the mushers about their incredible lifestyle. Tuck into a last breakfast before being transferred to the airport for your flight home. This holiday requires a minimum of 2 participants on all dates. You will be joined by other visitors for the activities and the maximum group size is typically around 24 people. All of the included activities were amazing and we thoroughly enjoyed them. We booked an additional activity on our second day, however, which was a highlight for us both. This was the daytime snowshoe hike. The guide was excellent and it was our first experience close up of the spectacular scenery in the fells. Read more quaint. The cabins were kept so warm and had a lovely wood burner and sauna which was fab after a day out in -20 degrees! Our package was half board which meant breakfast and dinner were included which was adequate for us. Both sittings were buffet style and although nothing fancy, were sufficient. Dinner was held at the Kelo Restaurant on Tuesday's and Friday's, just a short walk from the hotel which had a lovely atmosphere.We felt that the hotel kept to the feel of the place. Everything was kept to an excellent standard and all staff very friendly. Whilst in Luosto we went on five excursions which were included in our package; husky sleighing, the amethyst mine, the reindeer farm, cross-country skiing and snowshoe walking to find the Northern Lights!! Each activity was brilliant and we would highly recommend them. We also arranged an ice fishing experience which was fantastic and managed four outings on the slopes as we learnt to snowboard for the first time...which I have to say we fell in love with! We thoroughly enjoyed our stay and would definitely book again! Thank you very much for such an amazing experience in this beautiful winter wonderland!! Read more this holiday was going to be one to remember. We stayed in one of the Log Cabins which just added to the magic of the holiday. It gave us more space and was set in beautiful surroundings. Greta who met us at the hotel was an excellent host and representative of Artisan. She was really welcoming and was on hand whenever we needed her to answer questions or just to have a friendly chat. We can't speak highly enough of her, she is a real asset to your team. The activities were extremely well organised, so much fun and gave us a real taste of life in Lapland. Having cold weather gear provided for the week also took the hassle out of preparing for the holiday. We were so warm and snug. We would highly recommend the husky safari, which was truly brilliant, the snowshoeing at night time which was a real adventure and snowmobiling is a must for anyone looking for that adrenaline rush. The reindeer provided us with much entertainment due to their antics and misbehaviour.... all the guides were very friendly and knowledgeable and seemed genuinely happy to be taking us out on trips! For those looking for a break from reality, peace and quiet in stunning scenery and some unforgettable activities, Luosto is the perfect location. We would definitely recommend Artisan to others and hope to use you again. Absolutely fantastic. Would recommend 100%. Spot on. Our reps (Karen and Graham) were really lovely and helpful and whenever they saw us would come over for a chat and see how we were getting on, nothing like any reps I've known on holidays in the past who have often been completely absent or only there to try to sell trips! Read more Kelo Restaurant, but the main buffet was not as good but still tasty. Our transfer there was smooth however on the way back the flight got changed and was disruptive however it could not be helped and we landed home on time with our luggage. All the equipment was provided for the whole stay and was very useful, I would have brought my own mitts as the ones provided were very big and snow games only had 1 size. We loved all the activities but must enjoyable was the husky safari, everyone had a great time, and was such an amazing experience. The guide Laura was excellent very clear and lovely to talk to. Although the snow trek to search for the northern lights was fun there was a big group of us, would have preferred smaller groups on the trek. Most activities there were just 3 couples which was a good number of people. Also the reindeer safari was probably the most slow paced but still fun and glad we did it. The log cabin was great, very homely.